I have always loved hollyhocks, but for the first few years we lived here I could never get hollyhock plants to live through our harsh winters. Year after year I would plant hollyhock seeds and the plants would thrive through the summer and then just not be there the following spring. Then I read somewhere that single-flowered hollyhocks can survive much colder temperatures than the double-flowered hollyhocks I had been trying to grow. 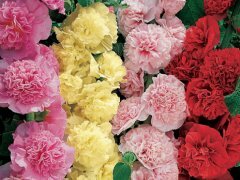 I bought just one packet of single hollyhock seeds… mixed colors… and planted twenty-five (I think) seeds that spring. The seedlings thrived all summer and every one of those plants lived through that next winter. Since then I have let my hollyhocks reseed themselves and have collected seed for planting in different areas, but I have never bought more hollyhock seeds… until this year. With all the years of reseeding, the bloom colors of my current hollyhocks have become paler and more subdued, and for the last few years many of the blooms have been shades of light yellow and pink. Beautiful… but it’s time for some more vibrant colors, and that’s what I’ll be planting this spring. All of these hollyhock varieties will bloom the first year if the seeds are planted early enough… which apparently is in February for blooms the first year… or at least two months before the first frost for blooms the second year. I want to start some seeds inside, but I won’t be able to put any seeds or plants in the garden until very late May or early June, and I think it’s a given that any seedlings planted inside in February would be too big to transplant easily by then. I’m going to try planting just a few of the new seeds inside… hopefully for blooms this year… and plant the majority of the seeds outside this spring for blooms next year. This way most of the new hollyhocks will have a slow blooming start, but in a year or two I should have some well-established plants… and after that I’ll be able to go back to letting all the hollyhocks reseed naturally. I couldn’t resist trying a double-flowered hollyhock again, especially since this one, Summer Carnival, is described as being hardy from zones three to nine. (We’re in zone four.) 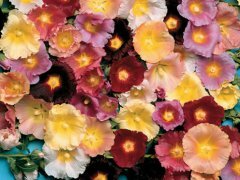 The seeds are for a mix of colors… pink, red, yellow, and rose… and the flowers are four inches across and are double or semi-double. The stalks are five to six feet tall. 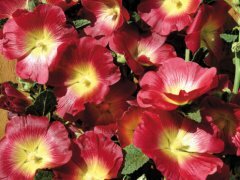 The Halo hollyhocks are supposed to be hardy from zones three to nine and not affected by either extreme heat or cold. These are tall hollyhocks, six to six and a half feet high, and they will need support. I plan to eventually grow them along the expanse of picket fence that borders our front lawn. They need full sun, and they will get that there. I have never had a problem with rust, but the Happy Lights hollyhocks are supposedly the most rust-resistant hollyhocks ever. These are mixed colors, in white, red, pink, purple, and yellow. The stalks grow from five to seven feet tall, so they’re another good candidate for in front of the picket fence. They also are hardy from zones three to nine. The Mystic Merlin Blue-Purple Mallow hollyhock (malva) is something different for me. Its two-inch across flowers grow on a dense, bushy shrub that is only four or five feet tall but two feet wide. 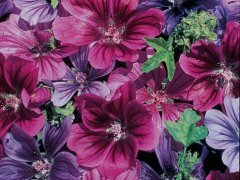 Like all these hollyhocks, the malva also blooms the first year from seed and the clumps can be left undisturbed without dividing. This is another mix of colors… hopefully I have seeds for shades of blue, violet, mauve, and purple flowers, all with dark blue markings. I’m hoping this one makes it through our winters… the seed packet describes it as being hardy from zone four, but I’ve seen this same plant described as needing at least zone five temperatures. The malva seeds should germinate in five to ten days, and the hollyhock seeds in ten to fourteen days. The seedlings should be transplanted when they have at least two sets of “true” leaves. Malva seedlings should be spaced twelve to twenty-four inches apart… hollyhocks, eighteen to thirty-six inches apart. They both prefer full sun but will grow in full sun to light shade. Hollyhock photos in this post courtesy of Park Seeds & used here with permission. 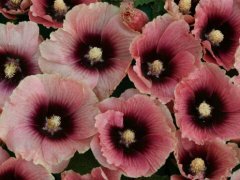 You will love the mallow hollyhock. I have grown these for years and really like them. Nice selection of new hollyhocks here but your others are beautiful too. What a beautiful garden you must have. I love hollyhock’s but never thought I could grow them. You have convinced me to try. 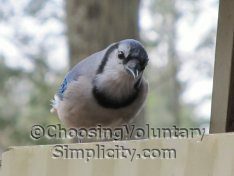 Thank-you for all the great advise and this wonderful blog. I just wanted to thank you for this wonderful site. You have given me so many hours of enjoyment, inspiration and information. I can’t thank you enough!